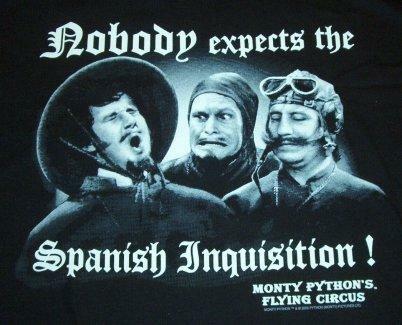 ... AND I LET MYSELF BE DUPED: Nobody Expects the Spanish Inquisition! As mentioned above, there was much talk through the country of the things that were happening in Alcala, each one telling a different story. Reports reached the Inquisition at Toledo, some members of which came to Alcala. The pilgrim was warned by their host that they were calling the companions the sack-wearers, or, I believe, the illuminati, and that they were going to make hash of them. They began at once to make enquiry and investigate his manner of life, and finally returned to Toledo without summoning him, although they had come for that sole purpose. They left the trial to Vicar Figueroa, who is now with the Emperor. After a few days he called them, and told them that an enquiry and investigation into their manner of life had been made by the Inquisitors, and that no error had been found either in their teaching or in their lives, and that therefore they could go on as they had been without any interference. But as they were not religious, it did not seem good for them to be wearing the same habit. It would be good, and they so directed, if two (pointing to the pilgrim and Arteaga) dyed their clothing black, and the other two (Calixto and Caceres) brown. Juanico, who was French, was allowed to remain as he was. The pilgrim promised to follow his instructions. “But, I do not know,” he observed, “what use there is in these investigations. Just a few days ago a certain priest refused to give communion to one of us, because he received every week, and they have even made it difficult for me. We should like to know whether we’ve been found in some heresy.” “No,” answered Figueroa, “for if they had they would burn you!” “They would burn you too,” rejoined the pilgrim, “if they found you in heresy.” They dyed their clothing as they were commanded, and for about fifteen or twenty days Figueroa commanded the pilgrim not to go barefoot but to where his shoes. This he did, as he found it easy to obey in matters of this kind when he was given a command. Four months later, the sane Figueroa held another investigation concerning them. Besides the ordinary charges, I believe there was another occasion of a married woman of importance who had a special devotion for the pilgrim. To prevent herself being recognized, she came veiled, as is the custom in Alcala de Henares, between two lights, to the hospital. On entering, she removed her veil and went to the pilgrim’s room. But they did nothing this time, nor even after the trial did they call him or say anything to him. Unfortunately, human as we are, even in Church circles success can breed jealousy and suspicion. 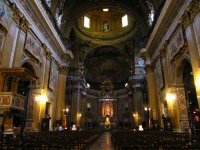 Ignatius and his companions were not “official” agents of the Church, and they were drawing big crowds and, even worse, inspiring some people to change their lives. There will always be those among us content with the status quo, and when others in their lives begin to make radical changes, even in the name of Christ, they are likely to be uncomfortable. They are also likely to become hostile to the perceived source of those changes—in this case, Ignatius and his companions. Enter the Inquisition. Anyone who has been involved in youth retreats, as I have been for many years, is likely to know this dynamic. Often young people are quite moved by a retreat experience and return home to their parents changed. Sometimes this is just temporary; other times it’s more lasting; and if the change is dramatic enough even Catholic parents might be showing up at your door asking what you did to “brainwash” their son or daughter. Ultimately, we always seem to end up with that small cadre of people who deem your ministry unsavory or dangerous, no matter how successful it is. And, again, since we’re dealing with a human institution, if they know some people “higher up” they could even manage to make your life difficult with questions and enquiries coming, even if they ultimately find nothing wrong. So it goes. That’s why I am so uncomfortable with these self-proclaimed watchdog groups who make it their business to dig up dirt on individuals or “report abuses” (I’m not talking about sexual abuse, though that can get out of hand too). They can too easily become abused and perverted into serving interests other than the service of God and the Church, often political interests (whether intrachurch politics or state politics). In Ignatius’ situation there is also something else interesting going on here. Ignatius was a promoter of frequent reception of Eucharist at a time when that was not common practice. So, as he describes, he and his companions have been denied communion on occasion because the priests noticed that they were receiving on a weekly basis. This kind of puts some of our contemporary fights about devotions and liturgical practices into perspective. Many of us are daily communicants and would certainly see nothing wrong in what Ignatius and his companions were doing. Yet, from the point of view of their time period, one could argue that what they were doing was wrong. If our practice with regard to something so important as receiving communion could differ so markedly at different points in the Church’s history (and even now Church practices can vary from country to country! ), how important in the grand scheme of things is whether or not we should kneel and when, and whether or not everybody needs to be doing the same thing. If even Saints bucked the common practices of their day, what might that say about the person we resent for not kneeling when we think everybody should. Imagine if that person turned out to be a Saint! Don’t I now look the fool?! I have been had a parent come to me after returning her son to her from an especially moving retreat and ask: "What have you done to my son, and who is this boy you brought back in his place?" She was stunned at how deeply her son could feel the presence of Christ, something she really only felt on the surface. I also agree with your indictment of what I like to call the "rubrics police". We have a chapter here and they drive me, the budding liturgist up the wall, because for me it is all about the beauty of liturgy and so not about how carefully we follow the rubrics. Thanks for reminding me of the important difference. In the same vein as the graphic: hee. People so often get hung up on the letter of things instead of hanging onto the spirit of them... it's frustrating. I get what you are saying about the "rubrics police" but just to bring another angle into your comments, there is much to be said for uniformity and universality at Mass and I believe that is what the rubrics are there to provide. The letter of things contributes to the spirit of things and I find it difficult to imagine that this is a hard thing to comprehend. I don't believe that kneeling is necessarily holier than standing, but I've been to many masses where there are so many different postures within the congregation during the various parts of the mass that it becomes extremely distracting and completely obvious that people get flustered by being unsure about what to do, and impossible not to notice unless you simply keep your eyes closed. I think this lack of uniformity is divisive to the communitarian aspects of Mass, that we are all there together and are acting as one body of Christ's faithful. And while I am very much a fan of beauty, beauty is less important than community. Also, beauty is in the eye of the beholder and as you well know, there are extreme disagreements on what constitutes beauty if the arguments over architecture and music are anything to go by. It would be better to abandon them both, than abandon the community building aspects of the Mass. As for saints beside us, I firmly believe that God doesn't send us many saints the likes of such path makers as St Ignatius and St Theresa , etc. The guy beside me might prove to be a saint, but I doubt it will because he thought standing up at Mass was better than kneeling.